I recently started following two really great blogs. The first I discovered via Facebook as the blogger is an old highschool friend of mine - Jo-Anna blogs about "A Pretty Life in the Suburbs". 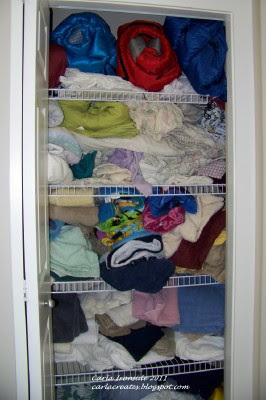 And then, through Jo-Anna's blog - I then discovered "I Heart Organizing". These blogs are right up my alley - - every scrapbooker loves all things 'pretty', right? And my Type "A" Accountant personality most definitely does Heart organizing!! Well in the last few weeks these bloggers have been posting about spring cleaning, organizing, and purging and I must say I am inspired!! I've had a whole lot on my plate this past year - by my own doing - I always take on too many projects! And I have to admit - I've been letting things around the house 'slide' quite a bit! As things have deteriorated around here - it has been weighing on my mind - but I felt overwhelmed about where to start to get things back in shape! So - my new plan as of this week - tackle at least ONE 'project' per week. No need to do it all at once. But by doing at least one thing per week - - I'll feel like I'm getting somewhere and it won't be so overwhelming! 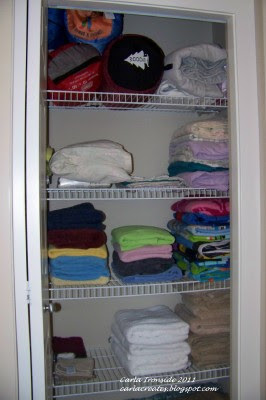 So I started today with project #1 - the upstairs linen closet! It feels soooo good to even have that one little thing done! Now I can spend the evening in my craft room absolutely GUILT FREE!! Look for a crafty post to come tomorrow! !